Both Jan Daley and Barbra Streisand have been recognized for having incredible voices thought their musical focus lies in different genres. While Jan Daley is a smooth jazz standards singer and Streisand is a cabaret standards singer, there is no denying that both of these women have incredibly unique voices that have helped them land the success they have today. Jan creates smooth jazz that is thoughtful and expertly executed. Her latest album “The Way of a Woman” is no exception. Her knack for swooning vocals, intricately written smooth jazz arrangements and pouring her heart into a performance are shown time and time again. This record has been giving her quite the amount of success on traditional smooth jazz radio stations such as KSDS (San Diego), WGVU (Grand Rapids), WPBR (Princeton) and KRTU (San Antonio). So keep your ears out for her song playing on a station near you sometime soon! In the meantime, you check out what Jan has to offer by heading over to from Noisetrade and getting a FREE DOWNLOAD of her song, “When Sunny Gets Blue”. If you love it, you can buy her new album, which also features “When Sunny Gets Blue”, on iTunes. To learn more about Daley and to keep up with her latest updates, check out her Facebook and her official website here: www.jandaley.com/. Jan Daley continues to impress all smooth jazz music fans with her incredible voice and music. She has been working hard in the music industry for many years now and just keeps getting better with every release that she put out. If you happen to be a big fan of Julie London and her incredible style of jazz music, you’ll be sure to love what Jan has to offer. Jan creates smooth jazz that is thoughtful and expertly executed. Her latest album “The Way of a Woman” is no exception. Her knack for swooning vocals, intricately written smooth jazz arrangements and pouring her heart into a performance are shown time and time again. It’s definitely caught the attention of many jazz radio stations including ones in Santa Barbara, CA and San Diego, CA. You can give her new album a listen on iTunes. For a taste, you can download the title song from her EP “When Sunny Gets Blue” FOR FREE from Noisetrade. To learn more about Jan and to keep up with her latest updates, check out her Facebook and her official website here: www.jandaley.com/. Trombonist and smooth jazz artist, Geoff Alpert has released his long awaited debut album, “Open Your Heart”. The album is a wonderful collection of ten tunes that takes musical ideas and influences from not only the jazz universe but also funk, rhythm and blues, pop and Latin music. The commonality between the tracks is Alpert’s superb and prominently featured trombone playing. After over forty years of teaching Ken-Ka-Kung-Fu, Alpert attributes much of his musical inspiration to the qualities of love and sharing that his martial arts experience taught him. After the painful passing of his wife in 2002, he went back to his roots and picked up the trombone once again and used the music as a vessel to convey his emotions. You can listen to the album on iTunes, CD Baby and Amazon. Be sure to keep up with Geoff on Facebook, Twitter, Reverbnation and his official website www.GeoffAlpert.com for any updates. With Christmas Day just around the corner, now is the time to take advantage of all the great music that has been released this holiday season. 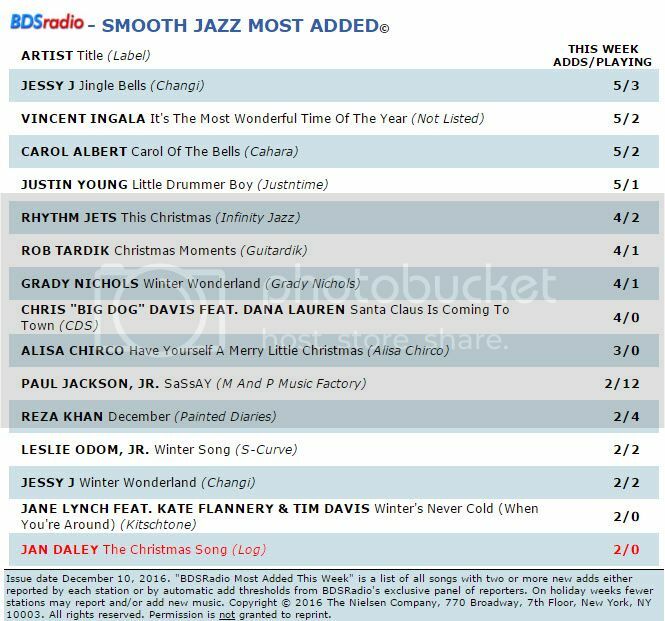 If you’ve been listening to the great Barry Manilow take on the Holiday classics, be sure to check out Jan Daley’s new smooth jazz Christmas Album as well! Daley stands prominent as one of the most phenomenal vocalists to hit the shelves in recent years and her Christmas arrangements are no exception. Her controlled bluesy timbre, stellar arrangements and world-class instrumentalists result in a true masterpiece of this holiday season. Jan reminisces through music to her touring days with Bob Hope and the emotional intent within the music is unmistakable. Her rendition of “Silent Night” truly illustrates the deep meaning that those times hold for Daley. Her stylistic versatility and immaculate intonation is impressive and well worth your time this holiday season. Don’t forget to grab a copy of the album on iTunes or on Amazon. Who doesn’t love Josh Groban’s Christmas Album? With his smooth voice and great instrumentals, it’s no question why. If you’ve got a kicking for some more amazing jazz Christmas songs, then you need to check out Jan Daley’s There’s Nothing Like Christmas. You’ll find your favorite Holiday classics along with a few original Christmas songs from Jan herself. It’ll make the perfect addition to your Holiday playlist and will be sure to keep your guests dancing all night long! If you’re interested then be sure to get your copy of the album on iTunes here: http://bit.ly/JD-NothingLikeChristmas or on Amazon here:https://bit.ly/TNLC-JD. In the meantime, keep up with Jan on Facebook here: https://www.facebook.com/jandaleymusic/ and on her website: http://jandaley.com/. Happy Holidays! If you love the smooth jazz sound from Michael Buble’s Christmas Album, then you are going to love Jan Daley’s “There’s Nothing Like Christmas”. She brings a new life to the Christmas songs that we all know and love by adding her own little jazz twist to the music. So much so that it’s even been included in the Most Added Albums for Smooth Jazz by Billboard! You’ll find the classics like “Have Yourself a Merry Little Christmas” and “O Holy Night” on the album along with some of Jan’s own Christmas songs including the title track for the album, “There’s Nothing Like Christmas”. It’ll be sure to keep you singing and dancing along this Christmas. Pick up your copy of the album on iTunes or on Amazon . Keep up with Jan on Facebook and on her website: http://jandaley.com/.